While we were at it, we got a passport for Curious George as well. Traditionally, plush toy monkeys have been permitted to cross international boarders without a passport, but post 9/11, one can never be too careful, especially the troubles we've had in the past. So, exercising the oft-cited “abundance of caution”, we went ahead with all the paperwork to set up George with proper documentation. George couldn't sign his name, so Anthony had to do it. Oddly, the Japanese passport office gave George a 10-year passport, but Anthony only got the expected a five-year child passport. Maybe plush toys age differently. I also notice that French has been dropped from passports. When I was younger, passports always had French in them. Maybe monkeys don't speak French. June 3rd, 2005 Fumie is a threat to homeland security??? > I also notice that French has been dropped from passports. > When I was younger, passports always had French in them. Nice passport, curious george must be very proud of it! Is this for real? I’m sorry but I’ve never heard of plush toys needing passports to travel. Is this only limited for travel to US? Could you please elaborate a little on this matter. Thank you. Maybe once everyone knew english, there wasn’t a need for the lingua franca? 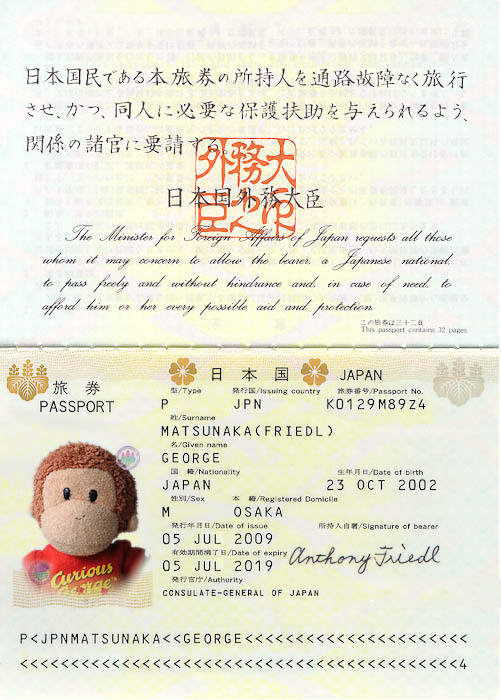 Did you photoshop this or did the Japanese really grant a passport for a plush monkey? “bon” passport George! Anthony’s cousin Gracie will love it, particularly because she’s recently discovered all things George. See you guys in a couple of weeks!